This week, staff and students from The Phoenix Academy visited The Mansfield Nursing and Rehabilitation Center. The students were amazing and so kind and helpful to the residents. There were so many smiles! 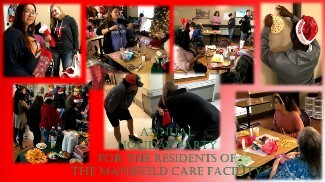 The students made snowflakes with glitter and hung them on the residents' doors. Some of the residents even joined in. The students passed out their home-made cards and stockings full of snacks and gifts. They went caroling down the halls and were invited into several rooms. They passed out refreshments and just sat and talked with some of the residents. They came back with so many personal stories of significance. This event will have life-long impact on both the students and the residents. Phoenix is truly a place where we focus on the whole person, not just academics.